Have a question on Flying Spur? Flying Spur is available in 15 different colors - Glacier White, Ghost White, Granite, Onyx, Meteor, St James Red, Sandstone, Fountain Blue, Special Magnolia Pearl, Pale Brodgar, Damson, Exterme Silver, White Sand, Storm Grey and Dark Cashmere. Watch latest video reviews of Bentley Flying Spur to know about its interiors, exteriors, performance, mileage and more. It is almost a century and Bentley has consistently presented performance cars wrapped with unconditional luxury within. The older version of Flying Spur was really a stretched version of Continental GT. But, the new version holds a distinct identity and is roughly related to GT. Flying Spur is not as grand as Mulsanne but Bentley reckons it's still a cut above your average German elite barge. Bentley's Flying Spur is an elegant luxury sedan that gives customers of UAE the choice to choose a car that is unique in the technology, evolved by the manufacturer Flying Spur makes up a profound as well as competent car in the league of premium luxury sedans. The powerful looks outside does not dominant inside and every occupant enjoys generous legroom and cabin space. The organ stop air vent, touch screen infotainment system, touch screen remote in back all together give significant control to the occupants. The veneers used for the mirror-matched waist-rails and dashboard, the matching glasses case in the console and the picnic tables behind the front seats are all carefully fitted by hand. The 11 separate balance mode radiator speakers music system coupled with big screen is sufficient enough to create theater surround sound experience within the car. Flying Spur offers a boot space measuring 475-Litres that is significant for carrying enough luggage. There is no ambiguity that Flying Spur is an ultimate luxury car. The marque's characteristic curves meet crisp, clean new edges in a remarkably sleek silhouette. The hand fitted chrome front grille meets the side line running along the car from rear wheel arch in parallel with the low roof and the bi-Xenon headlights with daytime running LEDs complete a powerful countenance when viewed from any angle. The overall dimensions of the car stands out (5299 X 1976-1984 X 1488)mm (L X W X H) and the wheelbase measures 3066 mm. Wheels are made in proportion to the engine variant and the standard 19 inches alloy wheels are equipped in Flying Spur. Further one can customize the size according to the need. The urge of rampant luxury and utmost performance is well catered by Flying Spur. The 4.0-litre V8 engine churns out maximum power of 507 PS at 6000 rpm along-with maximum torque of 660 Nm at mere 1700 rpm. The huge 6.0-Litre W12 engine draws maximum power of 625 PS at 6000 rpm and maximum torque stands out 800 Nm at 1700 rpm. Clocking 0 to 100 kmph mark in Flying Spur is seconds away and one can experience it in 5.2 seconds (V8) and 4.6 seconds in (W12). The top speed measures 295 kmph (V8) and 320 kmph (W12). The mileage offered is not very impressive but, in front of the enormous power and ultimate luxury it is not a matter of concern. Flying Spur delivers a mileage of 9.8L/100 km (W12) and 10.9L/100 km (V8). Smooth rolling comfort is ensured within Flying Spur. Kudos to the self leveling air suspension with anti-roll bar. Iron brakes with painted brake caliper coupled with Anti- Lock Braking System (ABS), Electronic Brake Force Distribution System (EBD), Hydraulic Brake Assist (HBA) and Drag Torque Control (DTC) for better braking system in any condition. The air bag system (Front, side and curtain),volumetric ultrasonic alarm system that detects change in time of propagation media in the car, impact protection system, sub frame rails, Park Distance Control are further conjugated with steel monocoque structure that further makes the safety features buoyant. With numerous amenities, pleasant cabin and enormous power behold in the two engine variants, Flying Spur is definitely a car that bridges the luxury one demands and the performance one expect. What is the price of Bentley Flying Spur? On road prices of Bentley Flying Spur in starts from AED830,000 for base variant V8, while the top spec variant W12 S costs at AED1.3 Million. 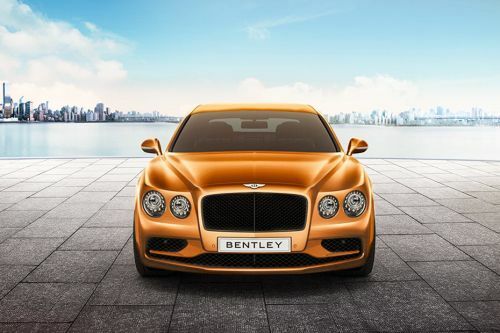 What are the colors options available in Bentley Flying Spur?